The first day of RRB ALP Stage 2 exam is successfully completed. Candidates have been waiting for the exam analysis anxiously. Here, in his blog we have compiled the detailed exam analysis of January 21, 2019. The examination was conducted in three slots. Candidates can know their performance in the examination by going through the analysis. This will help you to evaluate your performance and result. You can know your approximate result by checking with the exam analysis provided below. We have provided sectional difficulty level, weightage of topics, and more. The slot of the day, 3rd slot is completed successfully. The examination is undoubtedly easy to moderate difficulty level. Candidates writing the examination in the next two days can go through this analysis for your preparation. You can get a clear idea on type of questions being asked. RRB ALP Stage 2 slot 3 examination was overall easy. Here is the analysis for Slot 3 RRB ALP Stage 2. The Slot 2 exam is concluded successfully. According to the reviews of candidates who attended the examination, the difficulty level was moderate. Here is the complete analysis of Slot 2 RRB ALP Stage 2 exam. 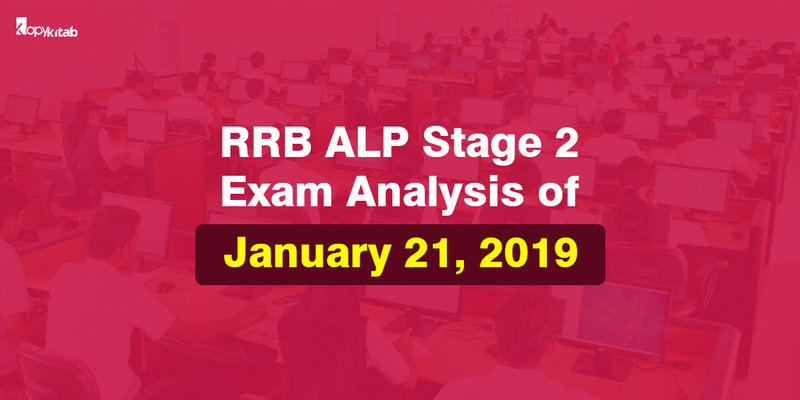 The RRB ALP Stage 2 exam consists two parts- Part A and Part B. Part A consists of four sections- Mathematics, General Intelligence and Reasoning, Basic Science and Engineering, General Awareness on Current Affairs. The overall time for the completion of examination is 1 hour 30 minutes and 0.25 marks will be deducted for each wrong answer. Check out the below table for number of questions asked from each topic, difficulty level, number of good attempts. Find the number of triangles?